Snug Vest by Squeezease Therapy Inc. one of six finalists in Rehabilitation & Assistive Technology category. Snug Vest is pleased to announce that it has been selected as a finalist in the Rehabilitation and Assistive Technology Products Category of the 17th Annual Medical Design Excellence Awards International competition. Snug Vest is an inflatable therapy product that provides deep pressure to individuals with sensory disorders, autism and anxiety. The pressure helps relieve anxiety by regulating the sensory system when it is over-stimulated. Firm pressure to the torso can help increase focus, reduce tantrums, and minimize stress levels. The Snug Vest inflates to provide adjustable and evenly-distributed pressure to the sides, shoulders, and back of the torso for a comforting hug-like squeeze without placing pressure on the stomach or chest. The user is able to safely inflate & deflate it when needed, promoting independence. Its stylish appearance ensures the wearer receives the pressure they require in a discrete way. 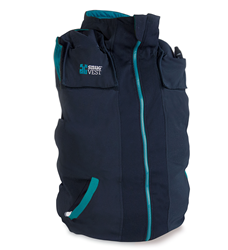 The Snug Vest enables the user to complete daily tasks with ease, anywhere they go! The MDEA is the medtech industry’s premier design competition committed to searching worldwide for the highest caliber finished medical devices, products, systems, or packaging available on the market. The awards program celebrates the achievements of the medical device manufacturers & suppliers who are responsible for the cutting-edge products that are saving lives; improving patient healthcare; and transforming medtech—one innovation at a time. “We are ecstatic to be amongst the top innovators in the world for Medical Device and Technology Design, and recognized as a groundbreaking innovation that is improving healthcare and helping lives. It means a lot to us that the jury comprised of medical and engineer experts recognizes that Snug Vest excels in design & engineering, technical innovation, clinical efficacy, and overall benefit to end-users & healthcare. All the years of dedication to making Snug Vest an all-around thoughtful, detailed, rigorously tested, and user-friendly product are objectively validated by the expert jury as our young company's product quality is recognized alongside established firms in the medical world,” says Lisa Fraser, Snug Vest Founder & Designer. Entries are judged by an impartial panel of medtech experts. Unlike other design competitions that are merely styling contests, the MDEA jury is comprised of a balance of practicing doctors, nurses, and technicians alongside industrial designers, engineers, manufacturers, and human factors experts. MDEA jurors comprehensively review entries based on the following criteria: the ability of the product development team to overcome all challenges so the product meets its clinical objectives; innovative use of materials, components, and processes; user-related functions improving healthcare delivery and changing traditional medical attitudes or practices; features providing enhanced benefits to the patient and end-user in relation to clinical efficacy; and healthcare system benefits such as improved accessibility, efficacy, or safety, in addition to providing attention to a critical unmet clinical need. Snug Vest is dedicated to helping individuals on the autism spectrum, or affected by other disorders such as Attention Deficit Disorder, Sensory Processing Disorder or anxiety increase their own quality of life and gain independence. For more information, follow Snug Vest on Twitter, Facebook or visit our website.